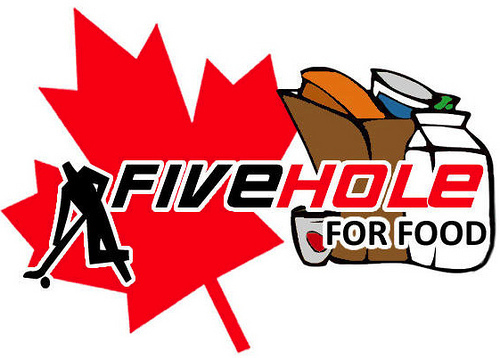 Five Hole for Food will see Vancouver hockey bloggers taking to the streets across Canada this summer to play hockey and raise funds for local Food Banks. The tour will stop in Montreal, Ottawa, Toronto, Winnipeg, Regina, Calgary, Edmonton, Victoria and wrap things up in Vancouver this July. “I love hockey and I wanted to find a way to turn my passion into something that could give back to the community,” said participating blogger, player and campaign founder Richard Loat (@Mozy19 on Twitter). “Being a proud Canadian, it occurred to me that in the name of community and charity we could play hockey for a good cause and thus Five Hole for Food was born.” Richard will be joined by over a dozen other bloggers including my old Crazy Canucks podcast co-host, JJ Guerrero. Across Canada each of the street hockey games have been organized by individual bloggers who will bring together two teams for the official match. “We’re also inviting anyone that wants to play to bring a can of food and their hockey stick and they’re welcome to join in the fun,” added Richard. Aside from the main sponsors, they have also partnered with local CHL, AHL, and NHL teams. The Five Hole for Food tour kicks off June 29th and will return to Vancouver July 9th. You can follow along on Twitter @FiveHoldForFood or on Facebook.